Hollybeary Creations : YNS Summer Kickoff!! This month at Your Next Stamp we are kicking off Summer with our Design Team Dare!! Head over to the blog to see all the Sumer creations and leave a comment while you are there for a chance to Win a Stamp Set of your choice! I always think of Watermelon in the Summer, it was a staple at every family gathering. 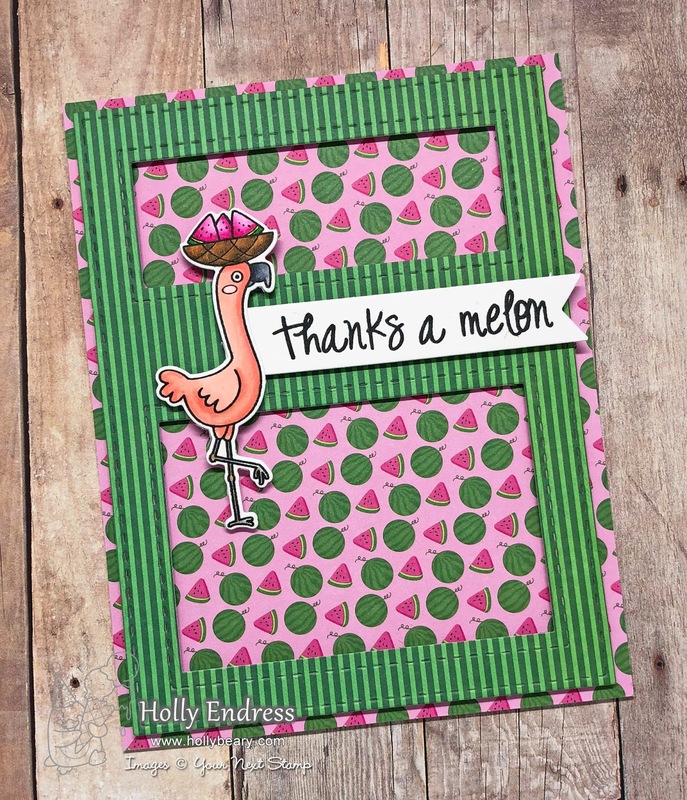 So I used the Fun Watermelon Party 6x6 Paper Pad and the super cute One in a Melon stamp set and Coordinating Die set. I created a top folding A2 size card base and then I added some of the Watermelon Party paper to cover the front. I die cut another piece of the paper using the Window Panel die and adhered it over the front with some foam tape. I stamped the sentiment onto some White card stock using Black Olive ink and die cut it with the Fishtail/Banner One die set. I stamped the flamingo image with some Black Olive ink and colored it in with Copics. Then I used the coordinating dies to cut him out. I adhered it over the edge of the sentiment banner with some foam tape. So cute... this set also features Hamsters and Parrots! Head over to the YNS blog for more Summer creations from the Design Team... Don't forget to leave a comment while you are there for a chance to Win! !